Water, Sodium C14 16 Olefin Sulfonate, Glycerin, Cocamidopropyl Betaine, Acrylates Crosspolymer, Cocamidopropyl PG-Dimonium Chloride Phosphate, Polyquaternium 7, Citrus Grandis (Grapefruit) Fruit Extract, Anthemis Nobilis (Roman Chamomile) Flower Extract, Camellia Sinensis (Green Tea) Leaf Extract, Carrageenan (Chondrus Crispus), Agar, Neopentyl Glycol Dicaprylate/Dicaprate, Ascorbyl Palmitate (Vitamin C), Propylene Glycol, C12 15 Alkyl Lactate, Polysorbate 20, Alumina, Butylene Glycol, Polyvinyl Alcohol, Disodium EDTA, Sodium Chloride, Sodium Hydroxide, Benzalkonium Chloride Solution, Sodium Benzotriazole Butylphenol Sulfonate, Titanium Dioxide, Iron Oxides, Red 30 (CI 73360), Red 40 Lake (CI 16035), Violet 2, Mica, Fragrance. This body wash didn't really do anything for my body acne. It smelled good at least and didn't make anything worse, so at least there's that. 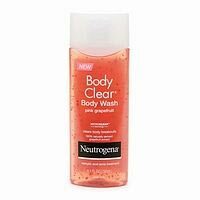 The issue with body washes is that the active ingredient rinses off before it has had a chance to penetrate the skin. I saw no difference in my bacne with this body wash. However, it did feel nice to know I wasn't doing more harm than good. The smell was nice. I enjoyed using this product. Smells nice Just made my acne feel worse I didn't do very much for me. It just smells good. *Lathers nicely *Smells fantastic *Beads *Pretty color *Doesn't clear up acne... *Acidic I have never been a fan of grapefruit products due to acidity, but decided to give this one a shot. The product is lovely to use, it smells great, gives a thick lather, and contains moisturizing beads BUT I saw no improvement in my moderate/severe chest, back, neck, and shoulders acne after going through an entire bottle. In fact, I would say my bacne got even worse. However, this product would probably work well for those with light or mild bacne. Smells great! Fewer Breakouts lathers good a little drying Ive been using this for almost a year now and when I first started to use it, it did clear some breakouts on my back and shoulders. Well the secret to get bacne free is to put lotion on after you get out of the shower. I guess it was too drying and thats why all the breakouts were not going away. I am totally clear now. I use johnson Baby lotion to moisturize. Good Luck!